Joe Young is the executive vice president of Payroll Network, the largest independent payroll and human-capital management services provider headquartered in the D.C. Metro area. Joe has been with Payroll Network since 2010, and since joining the company in a business development role has assumed responsibilities for leading its sales, business development, and new client implementation team. Prior to Joe’s joining Payroll Network, his career was highlighted with sales and entrepreneurial endeavors in the financial services, technology, and sports marketing industries. Joe’s first true sales position was selling corporate hospitality packages for major golf events including the 1997 U.S. Open at Congressional Country Club. Fred Diamond: I know you had a very successful career in a couple of different places. How’d you get into sales as a career? Joe Young: My first job out of college was actually down here in the D.C. area with what used to be the BlueCross BlueShield of the National Capital Area Plan before it was merged with BlueCross of Maryland and brought in really to support their sales team. I was there for about a year in inside sales support and doing presentations for a lot of their clients. I then had the opportunity for a dream job for a young guy who loved golf and loved sports to get into the sports marketing business. I spent six years in that industry, predominantly over at Congressional Country Club when it had some major championships, the Senior Open and the U.S. Open in ‘95 and ’97. It was a really exciting way to kick off a nontraditional sales career. 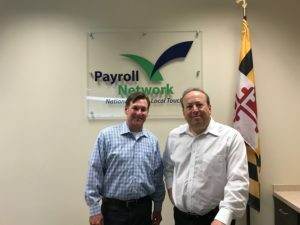 Joe Young: We joke a lot that our name in Payroll Network is a little misleading these days because we definitely sell a lot more than just traditional payroll services. The industry we’re in has really changed with technology. Over the last years had become a very exciting, fast-growing industry with, like a lot of other industries, a lot of tough competition. But beyond selling a software and a service to help people with the compliance and things around payroll and HR, I think the biggest thing that we look to try to share with our clients and prospects is that we’re really trying to help them change the way they do things and improve process in HR by using technology to do that. We talk a lot with our team that we’re more in the process-reengineering business than the software sales business, which allows us to have an impact on our clients, which is rewarding. Fred Diamond: Take us back to some of those first few sales jobs. What were some of the key lessons you learned? That was terrifying to me initially, but it forced me to overcome that fear and become something that I’m very comfortable with and really enjoy doing now. But getting out of that comfort zone was the real key lesson I learned early on: to test yourself and push yourself to new levels. Fred Diamond: You mentioned you were an athlete. What did you play? Joe Young: I was a soccer player through high school and through college and also was a competitive golfer as well during my younger years. Fred Diamond: You still get out on the course? Joe Young: Not as much as I like but still an avid fan of the game, and I look forward to trying to rediscover that game a little bit here as the kids get older. Fred Diamond: Back to the first job, that’s a great story about BlueCross and being thrust into speaking and having to get out of your comfort zone. Anything you learned at Congressional that has stuck with you today as well? Joe Young: Absolutely, that was such a life-changing experience in a lot of ways from a training perspective because we were a small staff. We really had to kind of figure out everything we wanted to do. I had this unique experience of being the day-to-day person managing our sales and marketing activities with the opportunity to work with a committee of individuals, of men and women who were assembled through the club at Congressional who really made up a lot of the business leaders in the Washington, D.C. area at that time. We really had put together the all-star business development team to open up doors for us to the business community, and the opportunity to learn and interact on a monthly and quarterly basis with this group of men and women at such a young age and early time in my career was incredibly impactful… Being with these successful people, one of the great life lessons I learned from them is this: the consistent and almost rabid optimism that these people consistently had in all the things that they did. They never saw problems. They always just saw “Okay, how are we going to fix this?” Very optimistic and positive about everything that they did. I tend to be a very pragmatic person and strategic, but I think in sales a lot of times, just learning to get out of our way, stay positive, and —not to be cliché—but follow the old Nike slogan of “Just do it” is one of the most important lessons we can learn. Fred Diamond: You’re in a very, very competitive space right now. You also mentioned that the industry has shifted where you’re now in the, what you were calling, the business-process reengineering space essentially. I’m curious: How do you work with your team to keep them positive when you’re selling something that a lot of people may not think they need to change from or haven’t really thought through all the benefits besides purely processing the payroll? Joe Young: It’s a great question, Fred. The great thing about the payroll business and the human-capital management business is everybody needs it. Everybody’s processing payroll for the most part, so there’s a tremendous amount of opportunity out there. But, as I just said, there’s also a tremendous amount of competition, and changing payrolls is not an easy thing and nothing that anybody really wants to do. We love to say all of our challenges [boil down to] “aversion to a conversion,” to making that change. One of the biggest things in our industry is identifying people who really have some pain and really gaining their trust to say, “Hey, we’re going to put you on a path to a better place. We’re going to allow you to operate your organization, not just process checks but interact with your employees. How are you and your employees accessing and utilizing your benefits packages? What are some of the technologies you’re using to onboard new employees to create that great first impression with them?” We really want to get away from just talking about selling a software package to being a partner with them and to implement it so it really has an impact on their business. That’s where we get the satisfaction and where we have to really focus with our team to differentiate ourselves. Fred Diamond: A lot of the great sales game changers that I’ve spoken to on this podcast have attributed a lot of their success to some mentors and early coaches. Who was an impactful sales-career mentor for you and how did they impact your career? Joe Young: I had a kind of nontraditional sales trajectory in that in all my time in sales, I think it’s only two years I’d ever had a true sales manager. I was always involved in sales and marketing being used in some small-business environment or some entrepreneurial-type endeavors. But, I think, looking back to some of the ladies and gentlemen early on in that time at Congressional, one in particular that I’ll call out and embarrass is my father-in-law. He actually was the general chairman of that tournament and exemplifies that unbridled optimism and positivity that really had an impact on me. I would say that my mentor today, Charlie Wolf, our CEO at Payroll Network, also embodies that same type of positivity and optimism that is contagious on a team, that keeps you focused on the goals and not the challenges that may be in front of you. Fred Diamond: I attended a workshop last week with a very well known speaker named Jack Daly. Do you know Jack at all? Joe Young: I do know Jack. I actually hired Jack to speak at a conference of independent payroll providers a few years ago. I had the opportunity to have dinner with him. He is as energetic and positive as anybody I’ve ever met. He’s amazing. Fred Diamond: We’re going to have him speak at the IES next year. The first thing that he talked about when he gave his presentation was passion. You’ve got to have the passion and you have to be totally optimistic because in sales there are constant challenges thrown at you—internal, external… Let’s talk about one specific sales success or win from your career that you’re most proud of. Take us back to that moment. But they had a unique problem. This was a large company, so it was a big opportunity for us. It was a tough one to lose. It was a large commercial cleaning company that has this unique challenge: They have thousands of employees in 300-plus buildings all over the greater metro area, and tracking time and attendance and when people are coming to work and not coming to work in that environment is really, really tough. They couldn’t find anybody with a solution, and in working with our team here we actually found a unique way where we could supply them with only a $40 Android device and do facial recognition, taking a picture of them through this device to clock them in, in a way that they could deploy it that would be secure. That was rewarding not only because we won the business but also because from early on I was working with the CEO and the president there to help them solve a very legitimate business problem. I think we all know in sales we all like to make a sale, but making a difference is always more satisfying than making a sale, and we felt like we really made a difference with this business. That was something as a team here we are very proud of. Joe Young: Correct. I think all of us in many industries, we’re not unique. It’s hard, and we get the struggle of being commoditized so that our prospects have trouble distinguishing us from one to the other. Looking at ways we can come in and identify an unconsidered need or identify an unexpected risk that these organizations may have—in helping them solve that, it’s truly when you’re adding value to them. It becomes less about your product and you and more about how you’re actually helping them run their business or solve their unique challenges. Fred Diamond: You’ve had a great career in sales, although you might have started a little unconventionally. Did you ever question being in sales? Was there ever a moment when you thought to yourself, “It’s just too hard” or “It’s just not for me”? Joe Young: Everybody has those days. But I’m a competition junkie, always have been. Going back to my youth, a lot of my growing up was around sports and activities in competition. Being a soccer player and playing golf in a team environment and then also something that’s very individual; you’ve got nobody to rely on but yourself. And also very measurable, which I liked as well because there’s immediate feedback, and you get that in sales. I felt those are things that drove me as a young boy and a young man to achieve the things I wanted to achieve that are important to me in life that I can translate into the sales world. No matter how hard some of those losses are sometimes, at least for me, the wins… always trump by tenfold the loses that you have. Everybody knows we’re going to lose more than we’re going to win in most situations, but the wins have always been sweeter for me than the defeats. Fred Diamond: Let’s get specific, Joe. What’s the most important thing you want to get across to the sales professionals listening to today’s podcast to help them take their careers to the next level? Joe Young: Fred, I really think that it’s very important for all sales professionals, regardless what stage they are in their career, to really take an entrepreneurial approach to their job and their role with their organization. I had the opportunity about 10 years ago. I partnered with a good friend and we started the business, and I was an entrepreneur for three or four years. Quite frankly I think it was one of the most life-changing experiences of my life. I almost think that everybody should try to start something on their own, even if it’s small, at some point because it really changes your perspective on how you look at things and how you just need to take ownership for what your responsibilities are. When we started our company, I didn’t have a marketing department. There was no implementation. Created a website, I wrote it, and we had to do everything. Most people in sales don’t have that they have those tools. But I think it’s important for a salesperson to take their territory, take their vertical mark, take whatever they do and look at that like that’s their personal company. In doing that you really just take ownership for that. There’s always a thousand excuses for why we didn’t win an opportunity or why we weren’t best positioned to win that sale. Was it our products wasn’t as strong in this area or our pricing isn’t as good? We can always come up with those excuses, but when you look at it through the entrepreneurial lens, you’re really kind of on your own: I’m just going to focus on what I can control. I think that’s where the most successful salespeople I see are, and those are the people I’m trying to recruit. They’ve had maybe some of that experience and look at their position and maybe their territory as their own personal opportunity for them to maximize. Fred Diamond: That’s a great bit of advice ,and I would say that that message pertains not just to sales professionals in small to medium-size companies but even large companies. People ask me a lot of time, “How can I take my career to the next level as a sales professional?” and one thing I tell them is “Treat yourself as if you’re the VP of sales for your business. You may be working for Company X but you’re responsible at the end of the day.” Hopefully the company is going to help you, give you the tools and branding and all those kind of things, but at the end of the day it really is up to you. What are some of the things you do today to sharpen your saw and stay fresh? Joe Young: It becomes harder and harder. Our workdays get longer. Our lives get busy. But I do think it’s important to continue to expose yourself to new thoughts and different things, to, as you said, sharpen the saw… I’m, like a lot of people, big on LinkedIn. I think LinkedIn is just a great tool to go through. There’s a lot of great content on there. I find myself 20 minutes before I go to sleep every night just going through LinkedIn and finding valuable nuggets that are good for me as a sales leader or for me to share with my team. I think most of my emails every morning are coming from things on LinkedIn I’m forwarding to myself to not forget to share. For me, though, as well the most important thing is I have been fortunate: Our independent payroll industry is a relatively small and tight-knit community. I have been very involved in some of our national conferences and created some great friends and colleagues who are owners and sales leaders around the country, and those are people who I talk to regularly. Developing a network of colleagues, friends, constituents, who you can trust and can call and say, “I need to bounce something off you” or “What are you thinking about this?” is really for me the best way to keep sharpening and getting fresh ideas. When you develop a network of trusted friends and colleagues who can be the people you go to who aren’t necessarily inside the four walls of your business, you get that unique and different perspective you need at times. Joe Young: The biggest initiative here at Payroll Network that we’ve been on over the past year comes down to getting the right people. We have focused so much on upping our game in the hiring process, and that’s made a tremendous impact in our operational staff, and I have been recruiting for new sales professionals and consultants to be a part of my team. I’ve been looking aggressively. I’ve hired one person the past nine months. I have a real laser focus on getting the type of people I think fit our culture, have that entrepreneurial bent that I mentioned earlier. I was at an event in the past week with a very, very successful entrepreneur, and he said, “Hire slow, fire fast.” Not to be callous and cold, but there’s a lot wisdom in that, and I think even more so in the sales environment. We invest a lot of time and money in salespeople. Churning half of them over every 12 months is not worth it. Take the time to get the right people from the start. Fred Diamond: Joe, a couple more questions. Sales is hard. People don’t return your calls or your emails. They’re not on your schedule. Why have you continued? What is it about sales as a career that keeps you going? Joe Young: It all starts with a sale. Until a sales happens, nothing happens. Fred Diamond: Nothing happens. The lights don’t go on. Joe Young: The lights don’t go on, and that’s impactful. You’re having an impact on the organization—on the people on your team and on them as individual professionals and people trying to provide for their families. I’ve always seen sales as such a critical part to the success of any organization. If you’ve got the greatest product, the greatest widget in the world, but you can’t sell it… it really doesn’t make any difference if nobody knows about it and nobody’s going to buy it. It’s very rewarding to have that type of impact on an organization, and that drives our ability to hire those other people in operations and make us a better organization, which ultimately leads back to us being able to sell more products. For my opinion, that’s where everything starts, and I want to be at the tip of the spear. Joe Young: Fred, I think I’ll go back to my comment earlier of having that entrepreneurial spirit. Be Fred Diamond Inc. Be Joe Young Inc. You’ve got a company name that you represent, and we always want everybody to do that with utmost professionalism and integrity. But at the end of the day, salespeople have got to look themselves in the mirror every morning and be able to answer “Hey, am I doing everything I can to do my best?” But when you take the mentality that “This is my business, and I’m maximizing this for me and my family and my business and others who benefit from that”… I think of the success that I see in people who take that approach to their career in sales.